Well, this sux. Barnetts is closing down. I have been shopping there since I was in grade school. We used to ride our bikes downtown and try to get to the magazines that were in the back of the news stand but the cashier knew what were about and always ran us off. I suppose change is inevitable, but this is a shame. An Athens landmark is soon no more.. This fall, the Richard B. Russell Library for Political Research and Studies and the Jimmy Carter Presidential Library and Museum will host a series of free public community issue forums in Athens, Atlanta, Tifton, and Albany where Georgians can come together, listen to one another, share perspectives, make informed judgments on key issues of today, consider how the implications of these policy decisions for tomorrow. The forum series is part of a nationwide initiative by the National Issues Forums, Presidential Libraries, and other organizations to encourage civic engagement during this critical election season. The forums will use the National Issues Forums (NIF) guides (www.nifi.org) to consider issues and will provide a civil and deliberative environment in which people from across the political, social, and economic spectrum can come together and consider public issues. Supercluster, The Heap, Jackpot City, Dana Downs, William Tonks, Clay Leverett and The Corduroy Road will pay tribute to Elton John this Friday at the 40 Watt to benefit the Athens Area Homeless Shelter in an event called "Gimme Shelter." Tickets are $10 and available from Schoolkids Records on East Clayton Street or from the shelter. The doors open at 9 p.m. and the music will start at the Athens prime time hour of 10 p.m. 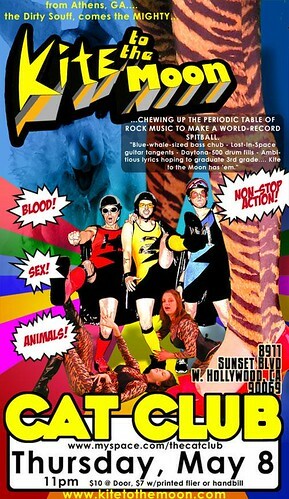 But first there will a pre-party at Cine at 6:30 with a version of the game show "To Tell the Truth." The current and former mayors will try to guess who is telling the truth about their occupation among three mystery contestants. Tickets for this event are $20 or $25 for admission to both events. Proceeds will benefit the Athens Area Homeless Shelter in its mission to assist families with children. This is the third annual "Gimme Shelter" event and the first with a pre-party. Visit http://www.athensareahomelessshelter.org/ for more information. 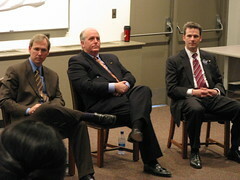 I watched the beginning of the debate among three Democratic Senate candidates yesterday evening. Dale Cardwell is focused on curtailing the influence of corporate interests and PACs; he compared PACs to packs of cigarettes with a play on words. Josh Lanier impressed me the most because he focused on the role of the United States Senate as an institution and had a sense of humor; his second campaign promise antecedent to an upcoming "uncampaign" was to move Saxby Chambliss' desk back to the Democrats' side of the aisle. Rand Knight tends to turn all questions to the environment and producing biofuels; at least his fake southern accent went away while he talked about something energetically. Below is information on a potential trail connection from the eastside that would allow bike commuters to travel off road (off of College Station Road) from the eastside onto campus and beyond. Public comment is needed TODAY so that the commission knows that there is public support to have this connection further studied for feasibility. This is also part of the bigger issue of whether to consider trail connections along certain public utility corridors for greater connectivity of our trail system. Please consider sending an email message of support to Public Utilities today at the email address below. This project is an upgrade of a sewer line linking Lexington Rd (via Shadybrook Dr.), to Barnett Shoals Road, connecting to the sewage treatment plant off College Station Road. See agenda map. Sewer lines traditionally have not included provision for trails, despite considerable encouragement from some Commissioners. Now we have another opportunity, and an exceptional one connecting to the North Oconee Greenway and South Campus---all off-road! This time there may be majority support on the Commission to include the trail option as part of the sewer project. But public support and encouragement are essential. SUBMIT a written e-mail comment supporting the trail option. Deadline is Tuesday 4-22-08, at 5 pm. The event will take place Saturday May 10, 10am-7pm, in the parking lot next to Agora. This is also Graduation Day and the day before Mother's Day -- there are going to be lots of folks out and about shopping for gifts and we think it's going to be a great day for a craft show! We want to make this event bigger and better, with more vendors and more activities to enjoy, so if you know crafters, artists, musicians, performance artists, djs, or any variation of the above, who want some exposure at a diverse event, send them our way! We are excited to see your applications, so get 'em in! Don't hesitate to email or message us with questions, and we'll keep you updated. Please cross post and share with your crafty friends! On April 18-20 and April 25-27, The Canopy Studio Repertory Company presents its spring concert: Water Body, original works of aerial dance with spoken word written by renowned author and naturalist Janisse Ray. The collaborative performance will incorporate works on silks, trapeze, ladders, bungee and invented apparatus by company members with video projection and sound design by Michelle Dodson, a graduate student in the University of Georgia Department of Theatre and Film Studies. everything we know, it also gives us life. Water Body is co-directed by Michelle Dodson and Canopy Studio artistic director Susan Murphy, who will perform in the show. The show is funded in part by a grant from Ideas for Creative Exploration (ICE) and by community support. Andy Herod, Athens-Clarke County District 8 Commissioner, kindly wrote in to respond to my post about the tiered water rates that were voted on this week. The baseline is winter '05-'06, not '06-'07. There is a first tier of 3,000 gallons per month that will be charged at the lowest rate, thereby protecting those who were conserving in '05-'06; after one has used that amount up then your cost will increase in tier prices, based on your winter average. Larger users will pay more because they will more quickly move up the tiers to the highest-priced tier, tier 4. For those whose circumstances have changed since '05-'06 (e.g., have added a child to the household) there is an appeal process. The committee chose the winter average approach because, they reasoned, this was when people were not using discretionary water to water yards but were using water that was essential to the size of their households for drinking, cooking, washing etc. The summer spike is due to people watering their yards, and the new mechanism is designed to try to calm that spike (as the summer is when we fall most behind in our rainfall). I was not on the committee and had some problems with just using the straight winter average from the first gallons of use because it would have punished light users. I think the 3,000 gallons as a first block was a reasonable compromise. There is no perfect system, and we will try this for this year and then either tweak it or look for a different one. But I guess we have to start somewhere. I appreciate Andy's response to explain the reasoning behind his vote. However, the only point that I agree with is the "reasonable compromise" aspect. It looked like certain commissioners may have not budged on using winter averages, so the 3,000-gallon floor at least moderates the effect on some people. My whole beef is with the winter average and its effect of charging different fees to households using the same amount of water. Andy explains that the point of the average was to find the amount of the water essential to the household, but this is flawed reasoning that does not justify such a plan. Different households have different lifestyles and different plumbing. What the recent drought has taught us is that water uses and plumbing fixtures inside our houses make a huge difference in our consumption. Let me explain. Some households use water for cooking, and some don't. Some use water for laundry, and some households use laundromats. Some houses have older toilets that use more gallons per flush. Some people (like myself) take two showers a day, and we know that many Athenians take only two per week. Also, some households use plenty of water for irrigation even during the winter. If we say that the winter average is essential, we are indeed rewarding those who waste water during the winter. We are deeming old, inefficient plumbing fixtures essential, and we are deeming it unessential for people who did not wash clothes or cook at home to begin doing so. An individual household's winter water usage does not reflect household needs. A uniform pricing tier would encourage everyone to adopt efficient usage practices at home. Commissioner Hoard's poverty anecdote was completely irrelevant because the plan voted on bases prices for everyone, not just poor families, on their past usage. If we want to base prices on household needs, then perhaps we should decide on an allotment per person and allow each ratepayer to report the number of people in the household. Yes, that system would be subject to abuse, but the actual plan is no better. I strongly disagree that the administrative process for appealing based on changed circumstances is appropriate. It is costly to the government and costly to the ratepayers. If the utilities department were to hear from everyone with changed circumstances, they would be overwhelmed; they are being called upon to perform a new function at a cost to the system. And the ratepayers who most need the relief are likely too busy working extra jobs to make ends meet, or they might not understand that they are even entitled to relief or how to pursue it. An investment of time is needed by both sides to process a request that may make a difference of only a few dollars per year. This is inefficient government and a burden on ratepayers. There is also the complication of giving the utilities department the burden of reviewing records and calculating the winter average. And what about the water accounts that didn't exist in '05-'06? What about the thousands of households without their own water meter because they are part of an apartment complex? Once again, the county commission has taken a simple idea -- this time, tiered water pricing -- and made it incredibly complicated. Every Monday at Little Kings. Starts circa 8 p.m. and usually lasts two hours, give or take. It's big fun, especially if you are a Rock (i.e. Rock 'n' *$#! Roll!!!) nerd, like me. Also, you (and your teammates) can win a Little Kings bar tab if you come in 1st, 2nd, or 3rd. Come and join the Oconee Rivers Audubon Society this Saturday, April 5th, at Whitehall forest. We will meet at 8am at Whitehall Forest along the road in front of the gate past the mansion, and please come prepared with your binoculars, clothing appropriate to the weather and practical shoes. Also, please don't be late! We will have to close the gate behind us once we are in and there will be no way to get in after that, though you will be able to leave at any time. As usual, the walks last between 2 1/2 and 3 1/2 hours, but one can leave at any time. The current forecast for Saturday is not particularly favorable, but we will be out there unless there is lightning - bring that poncho! Your water usage in the past will now determine how much you pay for your water in the future. On Tuesday the Athens-Clarke County Commission passed a water pricing plan using "average winter month methodology" based on ratepayers' usage during the winter of 2006 and 2007. The usage for each household will set its individual pricing tier. Water used above the amount of this tier will be charged a higher rate. That means if a lower volume household were to increase its usage to equal a higher volume user, it will be charged more. Two households using the same amount of water can be charged different rates. How does that encourage the higher volume user to use less water? How did seven commissioners suffer a lack of judgment and vote for this plan? Did they stop seeing the forest for the trees with Kathy Hoard's anecdote about poor people and Alan Reddish's warning about having a plan by June? I suppose they didn't they see the series of letters in the Athens Banner-Herald showing massive opposition to this plan from their constituents. Like many other proposals, some commissioners criticized it but voted for it anyway. Some had reservations but seemed to think it should be pushed along but could somehow be discussed further and modified later. I no longer enjoy bandying about my opinion on local politics in this public channel, but unfairness needs to be pointed out. This concept wrongly assumes that every household was using the appropriate amount of water last winter, and it wrongly assumes that every household's water need is going to remain fixed. I respectfully submit these criticisms and complaints to the community in hopes of finding out how this plan can be fair. I also submit that the Equal Protection Clause of the U.S. Constitution requires similarly situated people to be treated alike, and I don't think it is constitutional to charge residential users different rates for water without looking at their actual circumstances. Looking at historical usage in isolation does not actually evaluate a household's water need. Athens Transit now has live tracking of its buses on their website based on data from GPS devices. Yes, this is really neat, but I am still confounded at the priorities of this agency. They have invested loads into new technology, recently adding electronic signs and automated announcements inside the buses, and now they have GPS tracking on the website. Yet just last fall I could not find a simple map for Route 20, and I confirmed that it was unavailable. The printed schedule had only a timetable with no map. If they can't even print a simple map, why spend thousands of dollars on all this equipment? Assuming that the average transit rider walking toward a bus stop has an iPhone or other wireless computer of some sort at the bus stop, isn't this great that she can watch the buses move around on an electronic map? Yet she may have no idea where the bus is going or how to find a stop because the service doesn't print maps for all of its routes. I would rather The Bus provide useful information instead of showing off bells and whistles. The Sprockets Music Video Contest is accepting entries until April 15. Videos will be screened June 14 at the 40 Watt, and videos selected by the judges and audience will be screened on June 20 at Morton Theatre for the Flagpole Music Awards during AthFest. Read more on the film::athens website.